I have become a huge fan of Flash. I never liked websites that were built in Flash. They took too long to load. I never understood what was wrong with html. It’s still true that a website that is entirely built in Flash is not attractive to me. But delivering certain services in Flash, the way Etsy does with the shop by color or shop by geography, is a smart approach. But to me what is happening with Flash players and widgets is even more interesting. Flash players/widgets are becoming a new paradigm for content distribution and consumption. I can imagine a time when my desktop is covered with Flash applications that look like Apple’s dashboard. It’s already happening. When I go to the Hype Machine, I do a search for something I like, and then click listen. 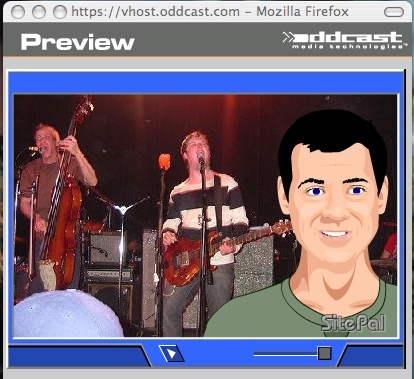 The cool brazilian open source Flash player pops up in a new browser window and plays music for me. I often keep that Flash player open for hours on my desktop. The other music widget I really like is the Streampad widget that I run on the left sidebar of my blog. I gave that Streampad widget my blog’s feed. It picks out all the mp3s I post on the blog and puts them into a single flash player widget. But the best thing is that you can click on the lower right of the Streampad widget and it will pop off the page and play the music for you for as long as you want. You get to keep surfing and the music stays with you. That’s the magic move I want from all the Flash players/widgets I come across on the web. 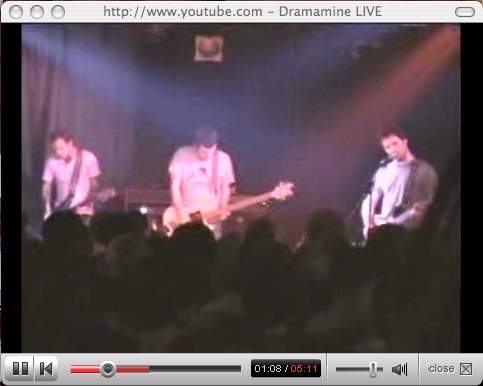 And it’s one of my few beefs with the YouTube flash player. It would be great if the YouTube flash player that pops out from the web page had a few more controls on it so you could use it to continue to play videos from YouTube from it instead of having to go back to YouTube. In fact, if you click on any of the two suggested videos that come up at the end of a YouTube video and you have the flash player open in a browser window on your desktop, it will take you back to YouTube. That doesn’t work for me. I end up just shutting the widget down. 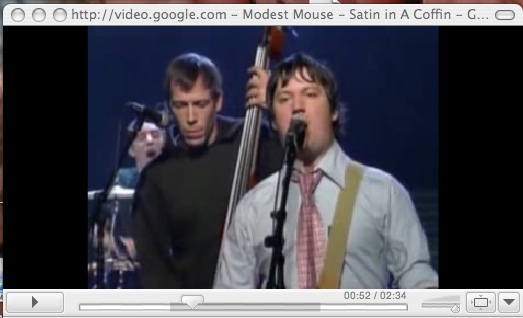 Google video works the same way as YouTube. You can pop out the flash player into its own browser, but it takes over the whole screen and you have to fuss with it to ge t it to be a widget on your desktop. The Google video widget doesn’t even give you more videos to look at after the video you watch is over. It runs a post roll thing like Revver does. They gotta turn these widgets into a persistent video app that you can keep on your desktop all day long. The other flash widget that I love on my blog is the Oddcast avatar. There is no way to make it popout of the page and onto my desktop. But there should be. Take a look at this screenshot. This is what happens when you are in Sitepal previewing an avatar you created. That exact same popout should be available on the lower right of the avatar on my blog and it should have community functions on it so people can leave me messages and I should even be able to IM through it. I know that Oddcast is working on stuff like that. I hope they plan to let my avatar live on my desktop instead of on a page if I so choose. I love the idea of using Flash to create a persistent set of apps that I can keep on my desktop all day long. As I’ve been writing this post, I’ve been building that desktop. Here’s what it looks like. It doesn’t work exactly the way I am imaging it should. But we aren’t far from the day when it will. Google launched Google Widgets for the web yesterday. Gotta get some Google bling on my sidebars for sure! So I’ve started with a FeedBurner widget (down at the bottom of the left sidebar). It shows how my subs are trending and how much FeedBurner owes me (I’d rather know how much I’ve made month to date and year to date, but that wasn’t an option). I have an even better widget coming that does something completely different but I need some help with it. I think you’ll like it when I get it up. Google’s done a great job with their web widgets. They are easy to use and there are a ton of them. I wonder if Google widgets might become a platform of sorts since they are so open. I’d like to get my sitemeter stats this way, my delicious popular this way, etc, etc. Possibly the single most common private email that I get regarding this blog is about the slow page load times and the ugly bling all over the sidebars (which are, of course, related). I must have gotten fifty to a hundred of such emails over the past six months. Fred Wilson’s blog is ugly. The words are wonderful, but is there any widget-badge-crap-bling-thing he WON’T put on it? The answer to that last question is basically no. If I like a web service and want to integrate it with my blog, the "widget-badge-crap-bling-thing" is going up. That’s how I like it. I’ve been thinking about how to offer a "fast and clean" version of this blog for several months. I’ve been focused on my blog’s feed, because if you read my blog in a feed reader, you get the fast clean experience everyone seems to want. And then I looked at my feed discovery page on FeedBurner and realized that it was pretty damn close to what people were asking for. The words and just the words. But that wasn’t quite enough for me. I want to retain the basic look and feel of AVC. Last spring Nick Denton showed me the new publishing system they are building and using at Gawker, code named ganja (gotta love code names that big companies won’t use). The idea behind ganja is that Gawker’s bloggers can all blog in whatever blogging tool they like best. Ganja takes the feeds that come out of those tools and publishes them in a consistent look and feel. There’s a lot more to it, but I love the idea of breaking the content creation and content display systems into discrete parts and using them in a distributed manner. So I’ve done the same thing with FastAVC. 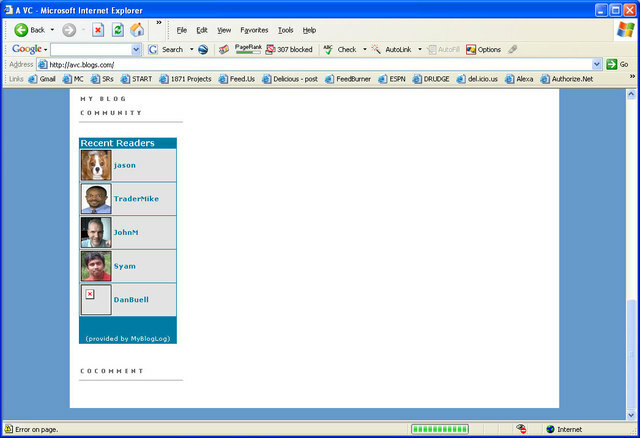 I’ve registered the name fastavc.com and currently it redirects to a new FeedBurner discovery page of my blog’s feed. The template has been edited to give it the look and feel of AVC, and you’ll see links to comment on the posts (back to AVC for that so there is only one comment system), and the familiar links on my FeedFlare. The next thing I want to do is host the FastAVC template on my web server and route the feed through it which will allow me to avoid the redirect to FeedBurner. But it’s working fine using the redirect (and has been for several weeks now) and I wanted to let all of you know about it. If you want to read this blog on the web but get fast load times and no bling, just bookmark www.fastavc.com and read my blog there instead. Like most things I do with my blog, this is an experiment and a bet on where things are headed. I believe syndication of content is inevitable. I believe that readers should be able to consume my content wherever they prefer to, be it at avc.blogs.com, fastavc.com, on MyYahoo, Netvibes, MyTimes, or some other web based aggregation system, or in a feedreader. I don’t believe in having one single place where people are forced to come to read my posts. So there are two now. I like this term – shopcasting. It describes a way of social shopping that I think is going to start to take off on the web. I’ve been shopcasting since I started my blog with my "in heavy rotation" list of music you can buy on Amazon. You simply click on the image of the record and you are taken to amazon where you can buy the item. But I’ve wanted to do more of that but it’s been too hard. I’ve tried a number of shoppping/product related bling on my sidebars, notably badges from Riffs and Nabbr, but they didn’t really work the way I wanted them to. As you can all see, I’ve got some new bling on my sidebars (scroll down) that is showcasing items you can buy directly from the images in the badges. These are my shopcasting badges and they are powered by a company called ThisNext that was profiled on the Business 2.0 blog earlier this month. Full disclosure, ThisNext was started by a good friend of mine, Gordon Gould. In this post, Gordon describes the vision behind ThisNext and why he and his partner Craig started the company. can attract significant enough consumer adoption. Exactly. It remains to be seen if any of these services can attract significant consumer adoption. But I am adopting ThisNext for a bunch of reasons, including my relationship with Gordon. 1 – they’ve got a nice bookmarklet that allows me to add any shopping related item I find on the Internet to ThisNext. You can see the "add to thisnext" bookmarklet in this picture of my Firefox toolbar below. 2 – the site has a very nice user interface that is pleasing to the eye and simple to navigate. 3 – the badge creation tool (they call it shopcasting) is simple to use and apparently will be powerful enough to allow mashups (like the surfing related flickr mashup badge the right sidebar on Gordon’s blog) and style sheets (like the elegant badges on both lower sidebars on notcot). I have created two ThisNext badges on this blog, both on the lower sidebars, roughly near my blogroll. The one on the left sidebar is controlled by me and showcases my favorite purchases of 2006. The one on the right sidebar is for all of you, my readers. Simply post an item to ThisNext and tag it with avc and it will appear on the right sidebar badge right below my blogroll. I got this idea from notcot and I love it. I posted the first item (typepad) but the others were not from me. That’s real social shopping! I hope you all find this new bling useful. I may convert my "in heavy rotation" and other music lists to ThisNext badges/lists as well. We’ll see. For now, I am just happy to be shopcasting on AVC. Hopefully you’ll all join me. Some of you might have noticed icons/faces next to some of the comments on this blog yesterday. That’s because the people at MyBlogLog turned on "comment/profile integration" on my blog yesterday morning. The coolest thing about this is that I didn’t have to do a thing. They just flipped a switch somewhere and my comments are now integrated with my community. If you have the MyBlogLog community on your blog, social network, and/or web site or service, then you can get comment/profile integration too. It’s working in TypePad as of yesterday and it will be working in WordPress and Moveable Type sometime this week. All you have to do to join the private beta is send an email to Eric (eric at mybloglog.com). I am really excited about this for a bunch of reasons. First and foremost, I recognize the names of frequent commenters, but now I’ll have a face or avatar or icon to add to the mix. That makes my life a lot easier and hopefully makes it better for the people who read and contribute comments to my blog. Blogger comments have worked this way for a long time and now we have a cross platform solution that will support all the major content management solutions over time. If you think someone has written a particularly interesting comment (or a particularly annoying one), you can click on their icon and be taken to their MyBlogLog profile. You can see where they blog, what other MyBlogLog communities they belong to, etc. But mostly I am excited about the possibilities of where this can go. Ever since I put MyBlogLog community on my blog, I’ve been thinking about the possibilities that result from combining community and social media/blogging. To date MyBlogLog has mostly been about promise because there hasn’t been much to do inside the community. Now with comment integration, we are seeing the first move. I suspect they’ve got a bunch more up their sleeves. So now when you are reading the comments and you see a little box that says "Add Photo" next you your name, click on that box and join my community. I’ll appreciate it and I suspect the rest of my readers will too. I’ve heard from a lot of people that my blog sidebars are such a mess they can’t deal with them. It’s true that I’ve got a ton of blog widgets on my sidebars and I think they are seriously impacting the page load times. I am sorry about that. But I can’t help myself. I find cool stuff and I want to play with it and my blog sidebars are my petri dishes. It’s the place I get to play with new web stuff. So with that intro, I want to introduce three new blog widgets I’ve added to my sidebars. 1 – coComment – On the right sidebar, under my community faceroll, I’ve added a coComment blog widget that in theory should list all the comments I’ve left on other blogs that also use coComment. And I’ve added coComment to this blog so you can do the same thing. I think there needs to be a consolidated comment system for the web and coComment is the closest thing to it right now. I’ve seen some cool stuff coming through my office that leads me to be hopeful that we are going to see even more good work in this area soon. 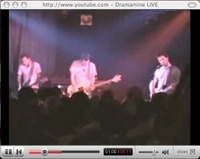 2 – Streampad player – also on the right sidebar, at the top of My Music links. 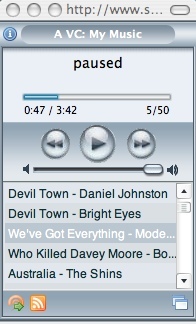 This widget loads the last 50 mp3s I’ve posted to my blog and let’s you play them as a playlist. It loads super fast but you can only listen while you have the blog page open. If you navigate away, the music stops. It would be great if you could launch the player into a new window and keep it playing. There are some other things I’d like to be able to do, like separate the mp3s I post from the podcasts I post, but for now, it’s pretty damn cool and I invite all of you to hit the play button and listen the music flow. 3 – Root Worms – on the left sidebar right below my blogroll. I’ve been sending my clickstream data to Root Vaults via the attentiontrust recorder for a while now. These worms let me show my clickstream data to the world. Want to know what I’ve been searching on or clicking on? Just take a look at the root worms and you’ll see. I need to get the attentiontrust recorder working on my new MacBook Pro as this data is just the search and clickstream data from my thinkpad which I’ve mostly stopped using. I hope to have that set up by the end of this week. I will keep these widgets up for as long as I find them useful. I hope you like them too.